It’s time again for the annual “Children’s Holiday Film Festival” – brought to you by The Downtown Holiday Festival, CareSource and THE NEON. Movies will screen one time each, and admission is free for children 12 and under and only $2.00 for adults. Please spread the word to your families and neighbors…we’d love to see full houses for each of these special screenings. FilmDayton hold its monthly “Film Connections” meeting Tuesday, Jan. 27, at which members met at the studios of ThinkTV to watch and discuss the work of local filmmakers. Followed by a networking opportunity, all are welcome! to the 2006 Democratic victories. The candidate’s son, film director Jason Zone Fisher, interlaces scenes from his father’s 1998 run for Governor with those from the 2006 campaign and includes vignettes of Ted Strickland, Bill Clinton, Hillary Clinton, Barack Obama, John Kerry,Robert F. Kennedy, Jr. and many more. $20. Tickets will be available at the door. The second annual ScreenPeace Film Festival will be held Oct 5th – Nov 9th at The Little Art Theatre in Yelow Springs, OH (247 Xenia Ave) and the Neon Movies in Dayton, OH (130 East 5th Street Downtown). Screenings will be held on Sundays at 12:30pm at the Little Art Theatre and 7pm at the Neon Movies. Festival passes are $39. Single tickets are $7.50. The award-winning 80-minute documentary feature, makes its Ohio premier at the Little Art Theatre, 247 Xenia Avenue (Rt. 68), Yellow Springs. The film is produced and directed by Oxford, Ohio, native Khashyar Darvich. The film tells the story of 40 Western innovative thinkers who travel to India to meet with the Dalai Lama to solve the problem of world peace. Among the thinkers is a University of Vermont professor. What happened was surprising and unexpected, and was captured by a five-camera, 18-person crew. This important film on human rights and world peace has played to sold-out audiences at film festivals around the world. This is the first film about the Dalai Lama and Tibet to open theatrically in the United States since the international spotlight placed on China for its firm handling of Tibetan protestors speaking out against Chinese policies in Tibet. Dalai Lama Renaissance has won a dozen film festival awards, and is the official selection of 38 film festivals around the world, where it consistently has attracted sold out audiences. In the documentary, the Dalai Lama discusses the calls for economic sanctions against China, and emphasizes that he could not support economic sanctions towards China since it would hurt the ordinary Chinese poor. The film features two of the starring quantum physicists from the hit theatrical documentary “What the Bleep Do We Know,” Physicists Fred Alan Wolf and Amit Goswami. Also appearing in “Dalai Lama Renaissance” are Michael Beckwith (who appears in the film “The Secret” with Wolf), Air America radio host Thom Hartmann, and others. The first “Film Connections” meeting was held last night and a group of about 30 people, including film makers, students, film buffs and a sprinkling of business people. The meeting began with the premiere of the FilmDayton logo prototype, as revealed by Bill Reiger from Nova Creative. Then local film maker Steve Bognar kicked the night off by sharing his recent experience at the independent film festival in NYC, followed by him showing some clips from his lastest documentary-in-progress. He also showed a brief skate board film, created by a Yellow Spings native, too shy to attent and invited Davie Powers to show his music video Crazy Loop, which was submittecd to ther national 2nd Numa contest and won $10,000. Ann Rotolante showed a trailer for the locally filmed True Nature. There were questions, announcements, and lots of conversation. Someone proposed a Tuesday Night movie club – in fact a group left to see the 9:40 PM showing at the Neon. People stayed around and talked until 9:30 PM, and various people volunteered to help. There were new faces and old faces, including Dennis Greene, Beth Duke et al, and J.T. Anderson. There were also film students from WSU and UD. The next Film Connections meeting will be Tues, Oct 28th from7-9pm. If you’ve got an interest in film, please join us! DAYTON — On stage in a local gallery on a sweltering July evening, J. Todd Anderson strayed from the topic at hand — his work as a Hollywood storyboard artist — and issued a friendly challenge to local leaders. Anderson — whose work has included storyboards for such films as “Leatherheads” and “No Country for Old Men” — called for Dayton to offer incentives to entice film projects here. Those assembled in the Cannery Art & Design Center‘s 520 Gallery answered his call with cheers of approval. Anderson, a New Carlisle native and Oakwood resident, is not alone in seeing films as an industry to be developed in Dayton. A recently launched group, Film Dayton, is an all-volunteer effort that wants to encourage more filmmaking in the region, including by offering incentives for film projects. Film Dayton is part of the Creative Region Initiative, an undertaking based on the work of urban theorist Richard Florida. The initiative wants to find ways to develop a creative class — professional thinkers and creators such as musicians, writers and engineers — to drive economic growth. Gloria Skurski, president of Film Dayton, said the group’s organizers haven’t determined which incentives might work best to draw film projects here. But they have begun looking at what other cities and states offer and hope to have some ideas to share with local leaders during the next couple of weeks, Skurski said. But filmmaking could give the area’s economy a boost, not only by employing local film professionals but also through the money spent here during production. Additionally, the project also is seen as a way to grow film audiences through such steps as creating a Web portal to plug local film festivals, Skurski said. State officials also are trying to lure more film production to Ohio. In December, Lt. Gov. Lee Fisher announced the launch of the Ohio Film Commission and the hiring of Christina Grozik as director of the film office. Grozik’s duties include promoting Ohio as a place to make films, television shows, music videos and other projects, she said. Contact this reporter at (937) 225-7317 or ttresslar@DaytonDailyNews.com. Aug 18, 2008 | Categories: Film Dayton | Comments Off on Lights, camera, Dayton! Film Dayton, the Miami Valley Restaurant Association, and the Cannery Art & Design Center collaborated for a successful Sneak Peek, the gourmet prelude to Miami Valley Restaurant Week. 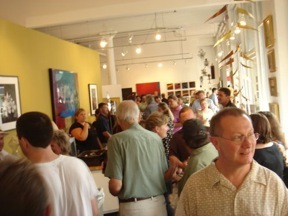 On Tuesday, July 22, from 5:30 to 10:00 p.m., an enthusiastic, multi-generational crowd of nearly 300 mingled inside the galleries and on the glittered sidewalk at the Cannery Art & Design Center, 434 E. Third Street. Sneak Peek included artfully presented and well received menu samplings from ten area restaurants and complementary bar service, staged in the colorful and creative space of the CADC Gallery. Following the dinner hour, guests moved to the 520 Cannery Space for the preview of “From Sketch Pad to Screen,” an exhibit of 1700 J. Todd Anderson storyboards from No Country for Old Men, Leatherheads and The Big Lebowski. In a first of its kind exhibit, the entire collection of storyboards for each movie was presented in chronological order, demonstrating the art of film preproduction. J. Todd Anderson, who grew up in Dayton, attended Wright State University, and lives in Oakwood, took the stage and talked about the process he follows when working with directors such as Joel and Ethan Coen, George Clooney, and currently Drew Barrymore. Anderson selected a volunteer from the audience who joined him on stage to describe an imagined movie scene, which Anderson sketched in storyboard form. 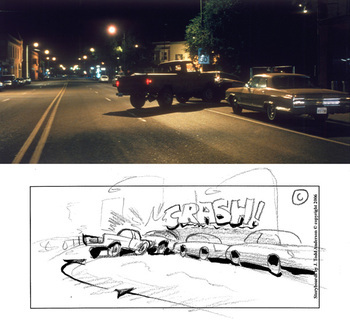 To demonstrate the process of storyboarding, Anderson quizzed the ‘director’ for more details and incorporated them into the storyboard, explaining camera angles, point of view, transitions between shots, use of storyboard symbols, and other techniques. He also entertained the crowd with personal anecdotes about directors and stars. 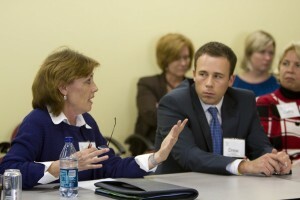 Review Dayton Daily News photos of the July 22nd Sneak Peek event here. Photos of the event by Andy Snow available here. August 1. During Restaurant Week, diners can enjoy three course meals at participating restaurants for $20.08 per person. 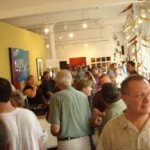 July 22nd was the fourth Sneak Peek event in the Miami Valley. View more details here. Collaborative Event to Benefit Film Dayton- July 22- Reserve Tickets Now! 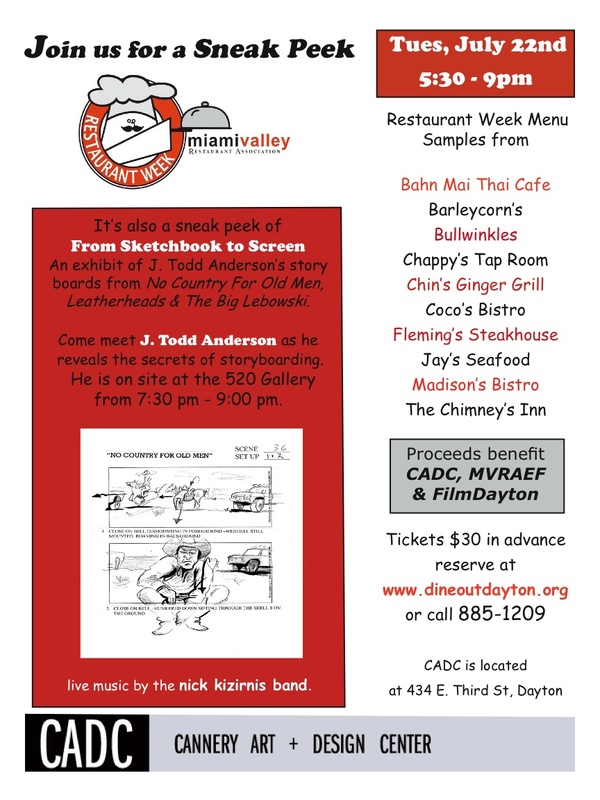 Film Dayton, the Miami Valley Restaurant Association, and the Cannery Art & Design Center have teamed up to present “From Sketch Pad to Screen,” an exhibit of J. Todd Anderson’s story boards from No Country for Old Men, Leatherheads and The Big Lebowski. Anderson will be onsite at the 520 Gallery from 7:30 to 9 pm, with music by the Nick Kizirnis Band and menu items from 10 area restaurants. Reserve your tickets now at www.dineoutdayton.org. Jul 02, 2008 | Categories: Film Dayton | Comments Off on Collaborative Event to Benefit Film Dayton- July 22- Reserve Tickets Now! Film Dayton, comprised of community leaders, film makers, and other interested parties, has filled key executive roles. Gloria Skurski will serve as president, Ron Rollins and Debra Wilburn as vice presidents, and Matt Joseph as secretary. Film Dayton is currently an all volunteer organization. Gloria Skurski is Director of Education and Broadcast Services for ThinkTV – Greater Dayton Public Television. Since joining ThinkTV in 1995, Skurski has been responsible for the development of broadcast and non-broadcast initiatives, including documentaries, cultural programming, public affairs programming, and multimedia curriculum packages. She also oversees ThinkTV’s services K-12 schools, including early childhood programs and media-on-demand services. For her work with ThinkTV, Skurski has won three Midwest Regional Emmy Awards. Prior to joining ThinkTV, Gloria Skurski worked for eight years at CBS News in New York, in the documentaries and public affairs division. Before turning to broadcasting, she served as executive director of the Riverside Shakespeare Company in New York City. Skurski’s husband, Stuart McDowell, is chair of the Theatre, Dance, and Motion Pictures Department at Wright State University. “Gloria has visibility in the film and general community, a history of support for regional film culture and events, and business and cultural connections. She has fully embraced the Film Dayton mission from the beginning. Her professional experience speaks to her ability to fill the practical aspects of the Film Dayton presidency. I’m pleased to see the initiative in the hands of such capable leadership,” said Debra Wilburn, who generated the idea for Film Dayton. Vice Presidents Wilburn and Ron Rollins, Managing Editor at the Dayton Daily News, were two of thirty two Creative Catalysts selected for the March 2008 Creative Communities Leadership Project training workshop, sponsored by twenty-eight area businesses, nonprofits, educational institutions, and individuals. Richard Florida and staff from the Creative Class Group led the group in developing initiatives designed to strengthen regional assets that contribute to the creative economy. Founding members of Film Dayton who now serve as officers include Wilburn, Rollins, and City Commissioner Matt Joseph. Other Creative Catalysts serving as Film Dayton planning committee members include Drew Fuller and Lisa Grigsby. Filmmaker Steve Bognar, producer Karri O’Reilly, and City Commission aide Erin Fuller round out the planning group. To date, Film Dayton has expanded to include thirty additional volunteers, including filmmakers, producers, composers, talent professionals, legal specialists, entrepreneurs, theatre management, scriptwriters, and nonprofit managers. General goals of Film Dayton are supporting regional filmmaking; cultivating regional film audiences; and developing the next generation of filmmakers and film audiences. Film Dayton expects to develop a grant program; mount a film festival; showcase regional films; promote a calendar of regional film related events; and advocate for more film production in the region. For more information, contact Film Dayton secretary and communications liaison Matt Joseph, matt.joseph@cityofdayton.org, 937.333.4991. The Film Dayton Initiative is concerned with supporting, retaining, and attracting local creative talent, a key indicator of the region’s ability to achieve economic competitiveness in a creative economy. Film Dayton will leverage existing assets of regional filmmakers, cast and crew, institutional programs, and related technology in order to grow the existing industry and to export the region’s film product. This will raise awareness of the region and it’s strengths. The goals of Film Dayton are to establish an endowment that will fund grants to local filmmakers who are making films in the region, and to host an annual film festival- beginning in 2009- eventually featuring films funded by Film Dayton. 1) Research creation of film festival. 2) Develop a business plan. 3) Identify donors, establish endowment. The first major volunteer meeting is expected to be held in April- check back for more information soon!